More than 35,000 people are reported missing across Australia each year, and although many are found, this is not always the case, and many families are left to deal with the pain of simply not knowing where their loved ones are, or what has happened to them. Today, as we do each year at the commencement of Missing Persons’ Week, we gather with families from the ACT who deal day by day with the disappearance of a loved one, and with the Police Officers tasked to keep searching for them. We will pray together that they may be found, and that their families might find peace. We’ve all heard the expression ‘you are what you eat’. Nutrition is a very important topic, we like to make sure our families are healthy and well fed, and yet we’re constantly bombarded by advertisements that tempt us to eat junk food. Last Sunday, Fr Charles challenged us to think about whether we were spiritually hungry. Perhaps we really are not hungry enough for spiritual food, or perhaps we are happy to settle for fast food that never really satisfies our spiritual longing, so that we suffer from spiritual malnutrition. Our lives can be stuffed full of ‘junk food’, or trivial things and busyness so that we don’t feel our deeper hunger for genuine love and affection, for the freedom to really live well and to know our deepest purpose. When we do feel these needs, do we direct them to God or do we look for seemingly easier or quicker answers? There is a food movement with the acronym JERF. When in doubt Just Eat Real Food. 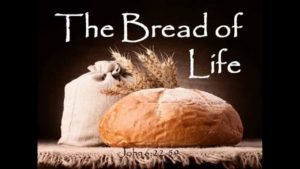 Those who eat the bread that God gives will never be hungry again, Jesus tells the crowds. Seek after spiritual nourishment. Search out Real Food, work for it, don’t look for easy answers, because it is only in this way that you will find true happiness and satisfaction. This morning we will eat and drink together at God’s table. We will bring our prayers for spiritual nourishment, or for Real Food, and bring our prayers for the missing and for their families, and then fed by God, we will go into the world in peace.